We got into Secret City which arrived onto Netflix at the end of June, so much so that we watched all six episodes in three nights. Originally aired in Australia in 2016 but taken on as a Netflix original and promising the second series, Secret City is a Canberra-based political thriller which had us absolutely hooked after a few episodes – but it IS a slow burner so do be prepared for that. The official description is as follows “A student’s protest leads to a government scandal that has personal and professional repercussions for one of Australia’s toughest journalists.” It’s been compared to House of Cards and not without merit, though a bit more slow moving – especially in the can’t-look-away-or-get-distracted viewing style because you will miss important details! I absolutely cannot wait until Season 2. It appears that we’re among the last to see La La Land. We finally gave in this weekend and checked it out. The beautiful pairing of Ryan Gosling and Emma Stone depict a “modern” Hollywood movie, a love story filled with song and dance and whimsy. I spent much of the movie rolling my eyes at the lack of realism (which may have just been the mood that I was in – though the fact that Gosling wore the same pair of shoes FOR THE ENTIRE FILM did get me!) but I have been humming City Of Stars since then. Added to Netflix in April 2018, this was a fascinating documentary I came across one night recently. Rachel Dolezal, the former leader of the NAACP’s Spokane branch, becomes a national news story when she is exposed for faking her black ancestry. This is no normal Netflix Comedy Special. The first twenty minutes feel like it. Hannah Gadsby is a very funny woman who discusses lesbian jokes, being a woman and X. Twenty minutes in, it changes into less of a comedy gig and more of a TED Talk confessional which is so important – toxic attitudes towards women, towards people who are different. It’s an emotional rollercoaster and the audience is enraptured, as was I. The line “There is nothing stronger than a broken woman who has rebuilt herself.” brought me to tears, after an hour of powerful words from this incredible woman. Make sure to add it to your Must Watch list. Eliott has been watching Pokemon. Living and breathing Pokemon. It started off as being cool, getting to share a nostalgia from my childhood with him. Since then, we have QUICKLY hit full saturation. Also, when you’ve stood on a toy Pikachu barefoot, it gets old FAST. He’s absolutely mad about it. He thankfully hasn’t discovered the cards, but we’re already surrounded by a collection of Tomy Pokemon toys and re-evaluating our retirement home dreams to whatever a Pokemon Trainer salary can put us in. This one has really caught my eye, as someone who suffers from chronic illness and has mentioned to doctors at various points that I’m willing to try ANYTHING to get it to go away. There are downsides to the nuances in medical advancements, in rushing into treatments. This documentary looks like an eye-opener into the terrifying effects on the health and lives of patients when implanted devices are rushed through clinical trials and given to patients before being fully tested. Season 6 of Orange Is The New Black is available to watch now on Netflix – it’s on my To Watch List! I like the creepier side of things – I watch crime procedurals and things like Criminal Minds to relax- so this show, about dark tourism has certainly caught my eye. From a nuclear lake to a haunted forest, journalist David Farrier visits unusual — and often macabre — tourism spots around the world. Journalist David Farrier visits breathtakingly bizarre and sometimes dangerous tourist destinations from around the world. I’m hopeful that it is going to be done in a tasteful way, and am looking forward to checking it out. So, that’s what we’ve been checking out, and what’s on my to-watch list this month. 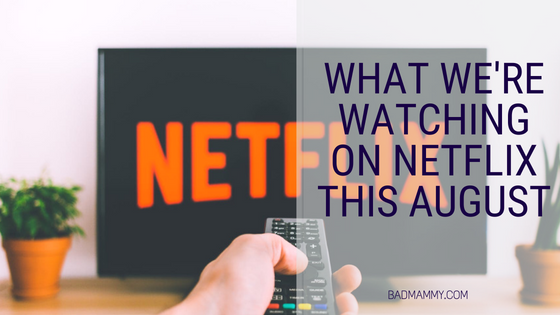 Has anything caught your eye, or have you watched anything on the list? Let me know your recommendations in the comments, over on Twitter, Facebook or Instagram – I’d love to hear from you! Disclosure: I am a member of the Netflix Stream Team. I’ve received a Netflix subscription and an iPad Mini in return for posting Netflix updates and reviews. However, all opinions are my own, and I already had a personal subscription before joining the Stream Team.